It's time to check off your wish list! 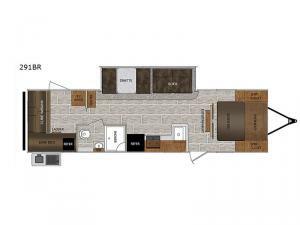 From a bunkhouse that sleeps 3-4 with double entry doors for easy loading and unloading your gear to an outside kitchen for the outdoor chef in the family, you are sure to want this Prime Time Tracer 291BR travel trailer on your next adventure. You won't have to worry about where to keep all of the necessities for your large family because the huge exterior pass through storage with over sized doors has plenty of room. The 19' power awning with LED lights is also big enough for you all to spend time together underneath it. And when you need to escape the chaos, head into the front private bedroom and jump into the Evergreen select foam queen size mattress, plus enjoy the storage space between the shirt closets on either side of the bed and the overhead cabinets. If you are looking for an ultra light weight travel trailer loaded with features then the Prime Time Tracer is perfect for you. These models have an Eternabond construction with laminated aluminum framed side walls, end walls, main floor, and slide out walls and roof, plus there is an aerodynamic fiberglass front cap with rock guard. A few other key exterior features include a high gloss gel coated fiberglass exterior, and a one- piece TPO roof backed by a 12- year warranty. Each of these units is comprised of features with the best quality. From the solid wood core cherry finish cabinetry, the residential high rise faucet, and the seamless counter tops to the AM/FM/CD/DVD Bluetooth stereo system with MP3 plug-in. These travel trailers are built to last so that you can enjoy comfort for years to come in any Prime Time Tracer.